When I first laid my eyes on Les Merveilleuses Ladurée Face Color my heart began to race, it was special but I could not for the life of me justify the $170 price tag. I looked online at some copy cats and other inspiration then came up with this DIY. This project was very easy and lots of fun to do, it will look great on a makeup vanity or would make a wonderful gift. If you have bought a full flower, cut and shape each petal and give them a thorough clean with soap and water then let them dry. 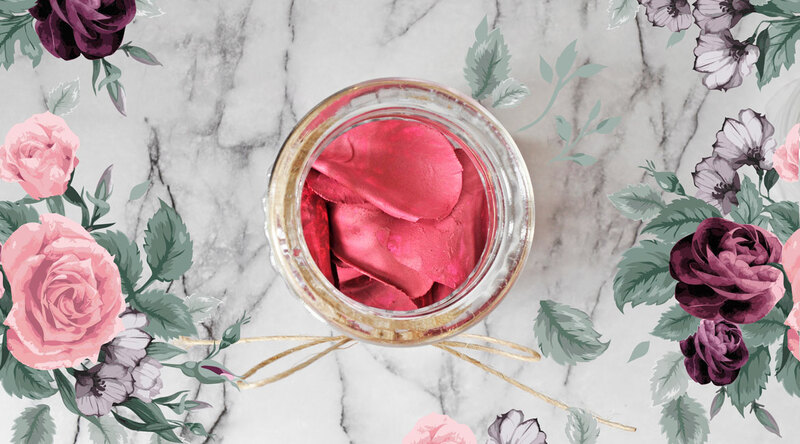 Crack your blush in the pan and pour it into the mixing bowl, crush it to a powder form. Add 1 Tsp of rubbing alcohol and 1 drop of perfume or scented oil then mix well. Dip each petal into the mixture, ensuring both sides are covered. With your tweezers pick each petal and gently lay them on a small towel or paper towel to dry. (Optional step) After 5 minutes when the alcohol has evaporated, you can brush more powder or pigment onto each petal. After a few hours when the petals have completely dried you can move them to your jar. If you have a blush laying around that doesn’t get used anymore this is a great project to make use of it! Ensure the jar you have selected is wide enough for your blush brush to swirl around in. this is so cool and so cute! Nice idea! Omgsh this is so awesome!!! I LOVE it girl!! I am totally doing this DIY! You’re amazing for this! Adorable! I saw this on some youtuber’s awhile back! What a neat idea to decorate your vanity with 🙂 Aside note, I did nominated you for an one lovely blog award! Sucha great post, love it. Can’t wait to try out on my own. You are such an inspiration. I will be trying this, great photos. I love how simple and easy this is! It would make a lovely gift for someone too. Wonderful idea, and I cannot wait to do this! This is amazing!! I will let you know if I try it! Please do 🙂 Thank you!